While the Dallas Cowboys paid tribute to Jerry Brown at a private memorial on Tuesday, questions emerged about the post-crash actions of Josh Brent, the player charged with intoxication manslaughter in the one-car accident that killed his teammate. Police in suburban Irving say Brent was speeding when his vehicle struck a curb and flipped early Saturday, hours before Brent was supposed to be on the team flight to Cincinnati. Brown was taken to a Dallas hospital, where he was pronounced dead. The Dallas County medical examiner said he died after suffering blunt force trauma to his head and neck. Officers who arrived at the accident scene found Brent pulling Brown from the wreck, according to an arrest affidavit. However, a woman who arrived moments after the accident said Brent didn't try to save his friend's life until she begged him. "Jerry was alive," Stacee McWilliams of Irving told The Dallas Morning News. "He was hurt. He was calling out, and his own friend walked away." McWilliams, a 40-year-old insurance company employee, said she was on her way home from her birthday party when she noticed the wreck and stopped. She told the newspaper Monday she could no longer talk about the case on the instruction of Irving police, and she did not respond to a message from The Associated Press seeking an interview Tuesday. 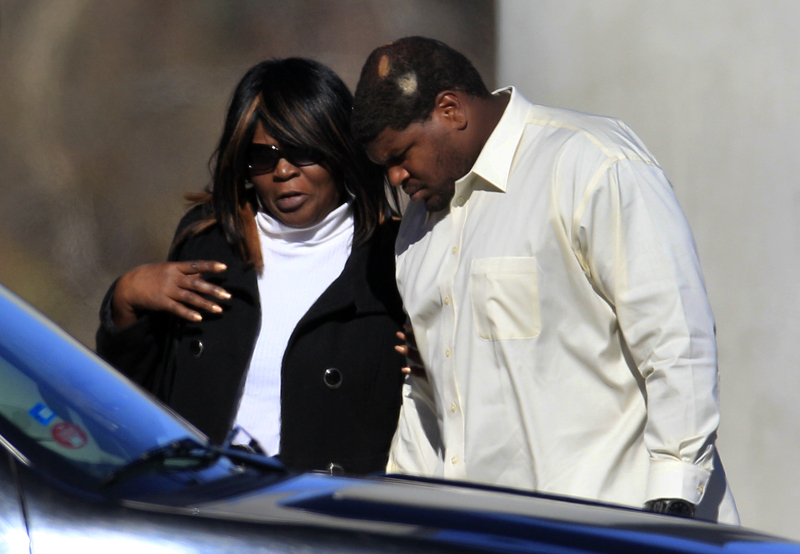 Josh Brent: Jerry Brown was "very best friend"
Brent's attorney, George Milner, told the AP that an investigating officer told him the woman's story didn't match the circumstances surrounding Brown's death. Milner said he was told that Brown "wasn't talking to anyone. He wasn't moaning. He was dead." However, a second witness also told The Dallas Morning News that Brown was alive. "I heard him moaning," said Pam Johnson, who said she saw the accident wreckage early Saturday. Milner said McWilliams also told police that Irving fire personnel weren't at the scene  another fact that isn't consistent with what really occurred. "Not one person in the Irving Police Department has said one thing that is consistent" with the woman's story, Milner said. Meanwhile, Cowboys quarterback Tony Romo, owner Jerry Jones and other players, executives and staff members arrived at the memorial service on a sunny but chilly afternoon at Oak Cliff Bible Fellowship in Dallas. Brent arrived earlier than most in a van with several other people and hugged an unidentified woman before walking into the building. Cowboys coach Jason Garrett said Monday the team would "support Josh 100 percent in every way that we can," while the NFL has "no issue" with Brent being at team facilities, spokesman Greg Aiello said.